20mM Tris, 150mM NaCl, pH8.0, containing 0.01% SKL, 5% Trehalose. Store at 2-8ºC for one month. Aliquot and store at -80ºC for 12 months. 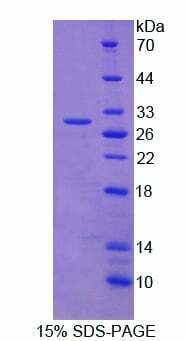 Small volumes of ADAM17 recombinant protein vial(s) may occasionally become entrapped in the seal of the product vial during shipment and storage. If necessary, briefly centrifuge the vial on a tabletop centrifuge to dislodge any liquid in the container`s cap. Certain products may require to ship with dry ice and additional dry ice fee may apply. Positive Control; Immunogen; SDS-PAGE; WB.